WINNER! Catering Heaven wins a coveted place in Theo Paphitis' Small Business Sunday family! Celebrate our SBS win with us! If you are on Twitter and follow the popular BBC Dragons Den member, Theo Paphitis, you may be familiar with his weekly #SBS competition. 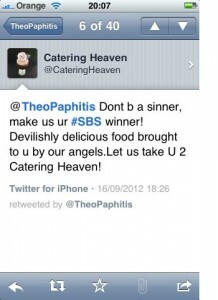 Catering Heaven have been personally selected by Theo Paphitis as one of the 6 winning companies who tweeted him including the hashtag #SBS on Sunday 16/09/2012! Theo re‐tweeted Catering Heaven”s message to his 260,000 followers and as a online casino result, we”ve had 100 more followers within 24hours of winning and extra orders for our catering, cakes and cupcakes. We are also profiled on a new website (www.theopaphitissbs.com) that is exclusive to Small Business Sunday winners – why not check it out? Get in touch with us today for more information about our services, for a personalised quote or to place your order! Filed Under: Blog Tagged With: In the Media, We've Won! 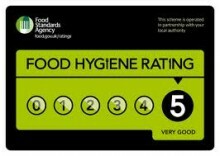 Congratulations to all the team at Catering Heaven! Keep up the good work!